Have you been able to save a little for these past two weeks? Have you had to take a trip to the grocery? Kicking and screaming... (not really) I did go to the supermarket. There have been some circumstances that forced my trip. It's ok though, because through it we got to celebrate a birthday with some extended family. My BABY boy turned 8 a few days ago! That's my youngest... My youngest is 8!! I am nearing 40, what?!?!? Excuse me for a minute. Ok, what? We were talking about the grocery store. Anyways, even if you have had to take a trip to the grocery store (like me) keep on with the challenge. Try not to go back. If you are like me, any time I can avoid it, I can avoid garbage foods and overspending. So don't give up. We've got 2 weeks to go. I think this is a great challenge and wish I could have taken part, but due to my recent diagnosis of type 2 Diabetes, I can't eat a lot of the foods in my freezer and pantry. I've blown it! Gonna keep trying though! I once did a challenge with my sister we called it the 50 cent meal challenge and we had a budget of 250 for 6 weeks. 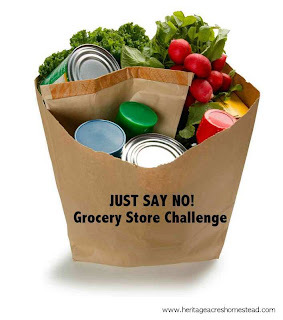 I love a challenge so gonna get with it and not go to the store!